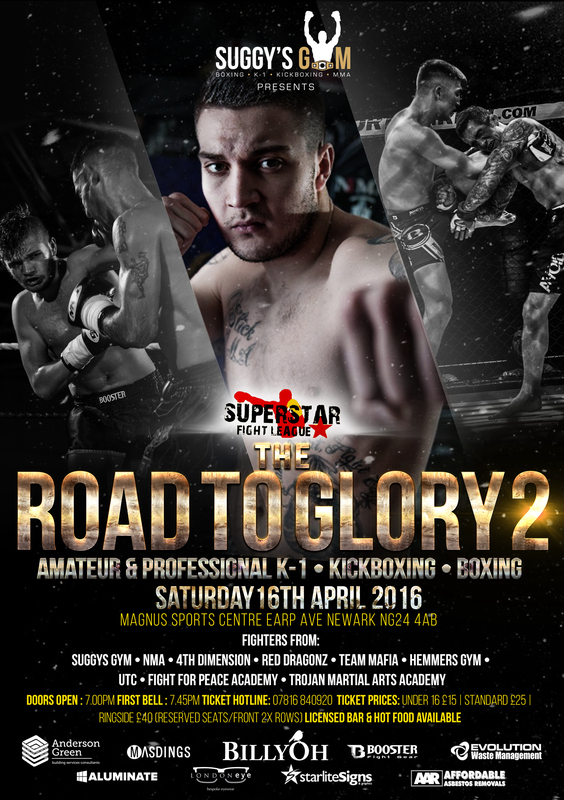 Non-stop fight action returns to the Magnus Sports Centre in Newark next month, when local K-1, kickboxing and boxing stars step into the ring for The Road To Glory 2. The event showcases the skills of amateur and professional fighters from Suggy’s Gym and NMA, all looking to follow in the footsteps of top professionals Chad ‘2 Slick’ Sugden and Regis ‘The First’ Sugden as they take on opponents from some of the UK’s leading clubs. In a first for Newark, Jeffrey van Overbeek of the world-famous Hemmer’s Gym in Holland will be among those travelling to the town on Saturday 16 April. In one of the night’s two headline bouts, he takes on Nottingham-based Celio Wagner who will be making his pro K-1 debut and fighting out of the equally well-renowned Suggy’s Gym. Sharing top billing will be Ammari Diedrick of 4th Dimension and Reinaldo Santos of Fight For Peace London, who go head to head in a 70kg max match-up, also under K-1 rules. The action kicks off at 7.45pm, with Megan Williams, Carl Thorpe, Connor Meanwell, Kristian Kraatz, Sam Hardy, Riley Church and Tom Mulligan also representing the Newark camp. Fighters from Red Dragonz, Team Mafia, Team Wallhead and former UFC fighter Andre Winner‘s gym will also feature on the card against the local favourites. Tickets for The Road To Glory 2 are on sale now from the gym on Castlegate or via the ticket hotline 07816 840920, priced £15 for under 16s, £25 for adults and £40 for ringside reserved. Doors at the Magnus Sports Centre open at 7pm and a licensed bar and hot food will be available throughout the evening.